Fans who managed to get into Hall H for the Marvel Studios presentation during San Diego Comic-Con were treated to some exclusive footage of some upcoming movies. Sure, the buzz might have been about the Avengers: Infinity War clip shown but there were also some funny scenes from the next film on Marvel’s docket, Thor: Ragnarok. The scenes showed Rachel House, a frequent collaborator of director Taika Waititi, getting into it with Tessa Thompson’s Valkyrie as both characters serve the Grandmaster played by Jeff Goldblum. ComicBook.com caught up with House at San Diego Comic-Con where House spoke about her character Topaz and the relationship she has with Valkyrie. Check out the video above! Topaz sounds like the kind of ally a Goldblum character can get behind. We’ll learn more about their relationship when Thor: Ragnarok hits theaters November 3. 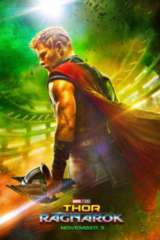 Thor is imprisoned on the other side of the universe without his mighty hammer and finds himself in a race against time to get back to Asgard to stop Ragnarok – the destruction of his homeworld and the end of Asgardian civilization – at the hands of an all-powerful new threat, the ruthless Hela. But first, he must survive a deadly gladiatorial contest that pits him against his former ally and fellow Avenger – the Incredible Hulk!